Austin Zilker Christmas Tree - The Zilker Christmas Tree with the Austin skyline seen through the tree taken from the ground. Every year the tree is on from the first of December till the end of the month for the season holiday festival. This is the 52nd year of the annual tree lighting and this show the tree with the food vendors at the base of the zilker tree with the Austin skyline. 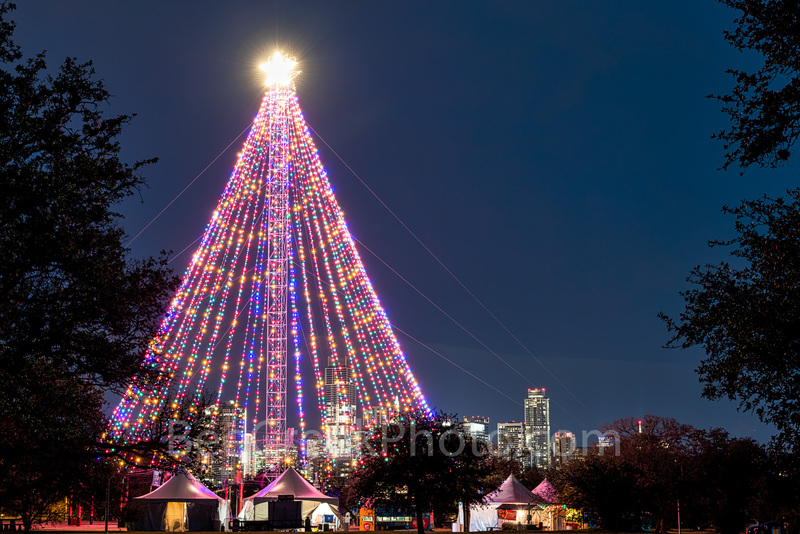 The zilker tree has over 3000 lights and stand at 155 feet tall as one of the largest man made christmas tree. Actually this one of the few moon towers that are still around Austin but it makes a great christmas tree. Photo © copyright by Bee Creek Photography - Tod Grubbs / Cynthia Hestand.